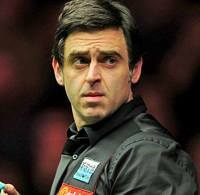 Ronnie O’Sullivan he is world best snooker player currently. He turned professional snooker player in (1992) since that period of time he won 30 non-ranking title snooker tournaments and 29 world professional ranking tournaments. He is now the most richest snooker player in the world from England. He plays snooker in fast and attacking manner. There are many records which he had break in snooker after Stephen Hendry. He earns more money then any other snooker player in last decade. He is five time world champion of snooker that brings his among the most talented snooker players in world. His career earnings were £8.5 million which he made after winning major prize money snooker tournaments. His currently professional ranking in snooker is World No 9 but before that he retains the world no 1 position during 2009-10 snooker season. He won 29 major ranking events that improves his overall record in snooker. O’Sullivan also holds the record for the most ratified maximum breaks in professional competition.